Design-forward Bluetooth headset maker Jawbone is getting off of people’s ears and out into real air with its new Jawbone Jambox, a portable combination wireless speaker and speakerphone that can be paired with Bluetooth devices to pump tunes out into real air, or handle phone calls without the hassle of headsets. And Jawbone says they’ve put special attention into making the compact unit deliver high-quality audio, with two drivers, an ultra-small-dome tweeter, and a passive moving-wall bass radiator to boost low end performance. 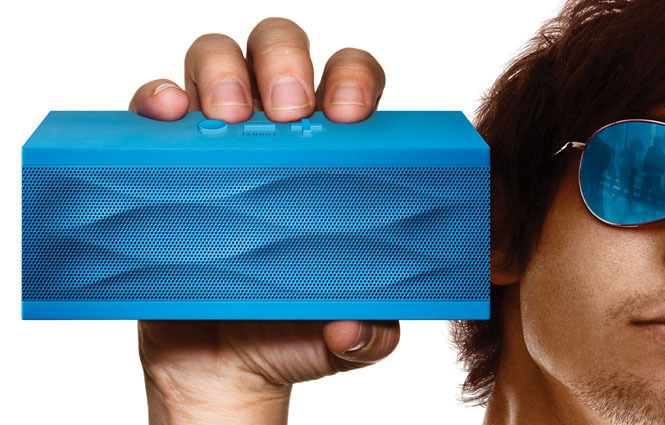 The Jambox is tiny—just under 6 inches long, 2.25 inches wide and about 1.5 inches high. The entire unit is wrapped in a single grille to cut down on the number of parts and fully expose the speakers for a richer sound. Jawbone says the unit can put out up to 85 db of volume at a distance of half a meter away, with a frequency response from 60 Hz to 20 KHz. The device supports Bluetooth 2.1+EDR and offers a 3.5mm stereo input; it also features a microUSB connector for charging and supports simultaneous Multipoint technology (enabled via Jawbone’s MyTalk technology) to connect to two devices at the same time. The Jambox comes with 60-inch and 12.5-inch and microUSB charging cables, an AC wall charger, a carrying case, and a 3-foot 3.5mm stereo cable. The Jambox is powered by a rechargeable lithium-ion battery that Jawbone says offers about 10 hours of continuous play (depending on the volume level and audio content). If users connect up to the Jambox via an iPhone, the iPhone can display how much charge time is remaining. Jawbone says the Jambox can be updated with apps, building on Jawbone’s MyTalk platform to add functionality. The Jambox offers audio alerts for battery life, caller ID, and call functions, and the Jambox can be personalized with voice and language options. The Jambox will be available in four colors—blue, black, grey, and red—and will carry a suggested retail price of $199. Online pre-orders are available now, and the units will go on sale November 16 in Apple stores and selected Best Buy locations.